Weighty Matters: Tim Hortons Junkie? Prepare to gain weight. 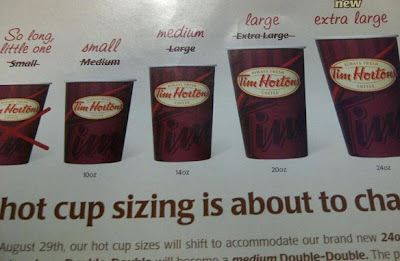 Thanks to Rachel Link and everyone else who sent me coverage about Tim Horton's elimination of their smallest size, and the shifting of all their sizes to one size larger. So just for kicks let's talk calories. Let's say you're a double-double drinker (as many Canadians are - for my American friends, a double double is double cream, double sugar). Let's also say that for each respective cup, you have two a day (meaning your Tim's fix was two small double doubles daily). If you continue to order up the same, given Tim's new larger sizes, how many extra calories will you be consuming a year? - New Small: 18,250 extra calories (roughly 5lbs more). - New Medium: 18,250 extra calories (roughly 5lbs more). - New Large: 29,200 extra calories (roughly 8lbs more). So for those keeping score, or if you yourself are a Tim's junkie, if you gain weight consequent to these changes, it's not because of your genetics, it's not because of inactivity or a lack of "willpower", and it's not because of epigenetics, obesogens, advertisements or ill-directed crop subsidies. It's because of one single, solitary change in your daily food environment. Think anything else has changed in our food environment since let's say the 1970s? How many other changes have there been that have been foisted on us that impact on weight? What year did chocolate milk start in school lunch programs, or vending machines show up in school halls? When did pizza and ice cream days become entrenched as fundraisers? Which genius decided that kids need treats each and every time they step on a blade of grass outside, or "sports drinks" when we were all just fine with water? How large has your go-to fast food combo grown? What meals is your boss bringing in for you to eat while you work late? How many foods are you buying that your parents used to make from scratch? How many times are you going out to eat or buying takeout because your day is spent tethered to an electronic leash and your evening chauffeuring kids around when you used to be free-range? The world has changed. While there are certainly hundreds of factors involved in societal weight gain, there's no doubt (in my mind at least), the most important factor by far is the environment we've got not choice but to live in, and if we really want to see things change, it's the environment we need to work on. Now of course bodies aren't perfect math formulas, and not every Tim's drinker's going to gain weight - but some are. And that said, daily Tim's coffee drinkers, maybe now's the time to make the switch to black?